In my last post I mentioned I had just received my attendee pack of goodies for Tom Bird's Write Your Book in 5 Days Retreat. 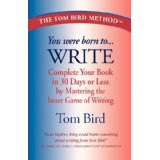 I have finished reading the first book, You Were Born to Write by Tom Bird, and attended my first webinar. In the first part of the book Tom offers 17 Writing Principles which are basically affirmations created to counteract false beliefs. One of these really hit me; I actually cried when I read it. All the inspiration we need is already inside of us. I won’t bore you with all the memories that flooded my mind when I read that but let’s just say that the fact I am sharing my emotional reaction with you is proof to me that something has already shifted inside. Who ever heard of an author afraid of sharing emotion? Exactly the point. This retreat is not only about writing a large number of words per day; it is about getting to the core of what blocks you from prolific writing. Tom is all about changing the innermost blocks and releasing the innermost you. In fact, Tom is so intent on making sure the transformation is complete he has arranged for bodywork therapists to be available during the retreat. During the webinar Tom introduced us to Lori Zeltwanger, PT, owner of Advanced Release Therapy. Lori is a Physical Therapist who specializes in facilitating the release of physical, emotional and energetic blockages. I am hoping to have a few sessions with Lori so I can share with you how the bodywork adjuncts Tom’s method. Come with me! There are a few spaces still available for the March 24-29 retreat at the beautiful Sedona Rouge. Special prices are available for both the retreat and the hotel rooms. Check out Tom’s June and August retreats; the first 12 to sign up receive special pricing! Contact Tom at TomBird@TomBird.com. This sounds really really interesting! I'm going to have to keep this retreat in mind. Looking forward to more of your reactions! I didn't mention it yet but I think the subliminal CD helps. I'll try to pay more attention to it and let you know. Tom said it would be playing most of the time at the retreat. Definately not the average writer's workshop! Robyn, I love reading about your journey - esp your style of writing from the guests reactions to the Tom Bird Method to the meals served and your room layout - exactly what I'd like to know before signing up for a trip across the country. Thank you!! I will be following up the casual posts at The Muffin with a full review of Tom's retreat at WOW-Women on Writing. I might also write a a post focusing solely on the Sedona Rouge. By the way--you can "test drive" Tom's methods by downloading a free webinar from the free page on his website.